A lot of work has been going on, with some setbacks. Firstly, I had fun making the hardwood floors out of self stick hardwood veneer strips cut to plank size, and installed on foamcore board colored black with a giant sharpie marker. I used a medium tone color for the great room and a dark stain for the bedroom. The wood came in colors that I could choose from. I used a craft sliding paper cutter to cut the veneer, which worked great. The floors will have finished edges later. For now you can see the foam core board. I do rather like the final pendant lights, but they are too light to hang well. Thinking about what I can do about that. Add weights? 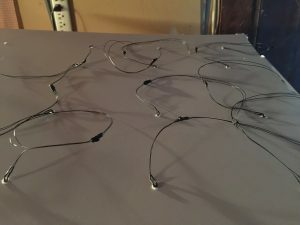 Break down and buy glass fixtures? Oh boy. Problems, problems! I really liked the initial pendant lamp for over the dining table, but hanging it is not working out. I really have to work on figuring out how to suspend it and hide the electrical wires for the LED bulbs. What I really need is thin metal tubes. Probably can find some, but where? 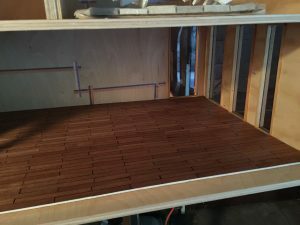 I can then start connecting the lights to the ceiling tapewire, which is going to be difficult due to the depth of the room and the 10 inch ceiling height. I’m using museum putty to affix the false ceiling to the real ceiling to hide the tapewire and allow depth for the can lights. I had a great birthday, and enjoyed my new tools and my Phillip Nuveen Barcelona chairs for my mini house living room. I can hardly wait to start furnishing the house! Pity it’s going to be a while yet. But then, I mostly am enjoying the construction process, despite the occasional frustration. Last night I spent some time doing the elevations for the kitchen. I do love doing drawings for architectural work! I have no training in this but I still enjoy it! The kitchen is a galley kitchen with the refrigerator, stove and cabinetry against the back wall of the great room, extending for 15 inches, and a large island wide enough to allow for counter stools across from the wall of cabinetry. The “island” which is really more of a peninsula, consists of a sink, dishwasher, cabinetry and drawers, and has three pendant lights above it. The back wall of cabinetry has LED under cabinet lighting. I started work on installing the can lights in the false ceiling. Jasper, my pussycat, tried to play with the wires – aaaauuuughhh! Had to hide it from him. I don’t have enough LED lights, had to order more. 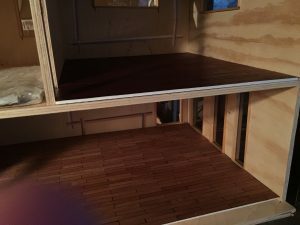 I realized that in order to finish installing the lights I am going to have to make the pendant lights and the chandelier, so that is what I will be working on next. And another showing the side with the living room windows and the upstairs bedroom window. This was a lot of work, and I damaged some of the acrylic sheeting in the process. I may have to remove and replace a couple of the pieces of acrylic. There was a bit of a learning curve on cutting the plexi. Believe it or not, I could not find much online about cutting it, and after trying multiple different tools, I found that cutting it with – wait for it – scissors – actually worked the best. It does mess up the very edge of the acrylic but since I knew that would be covered, I could live with that. The two story, giant window at the side of the foyer was a real bear to install. 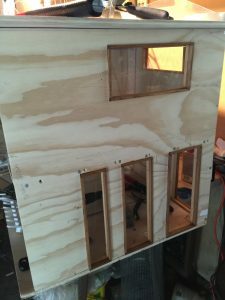 I had to resort to using tiny nails rather than just gluing in the window frame pieces. 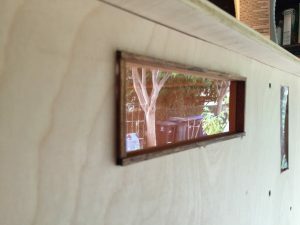 And it took a long time to cut and stain each interior 4 pieces of window trim for every window as well as to cut and stain each exterior 4 pieces of window trim for every window. Whew! I also finished tiling the “granite” floor on the second story of the foyer. And I’ve made patterns for the floors, which I will install over Bristol board and then fasten in place in the room. The downstairs great room will have hardwood floors. I’ve been spending time cutting the planks from my pieces of veneer, and will glue them down onto the Bristol board. I love the finish on the veneer, which is matte and a honey color. I have darker wood for the bedroom floor. I am sorely tempted to use real stone tiles on the bathroom floor, but if I do that, it will make the flooring thickness inconsistent throughout the second level. I guess I’ll have to think about it. Meanwhile, I have cut up the vinyl “travertine” into tiny tiles to use for the bathroom floor. Hmmm…. My birthday is coming up, and I’ll be getting a few furniture pieces! Yay! 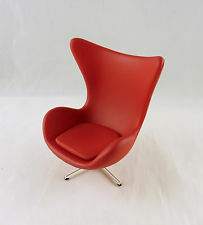 I’ve also ordered a red modern chair for the bedroom furniture layout. It is one of the Japanese Reac pieces. I’m hoping that someone will get me one of the Phillip Nuveen Barcelona chairs I’ve put on my birthday wish list! I think it will look very cute in the bedroom. I’ve done some shopping for wallpapers as well, which was fun, and for planters for the plants I’ll be making from artificial floral pieces.